Here's the big secret behind customer relationship marketing: It's not merely about what you say and do that makes customers loyal. It's fundamentally about how you make them feel. 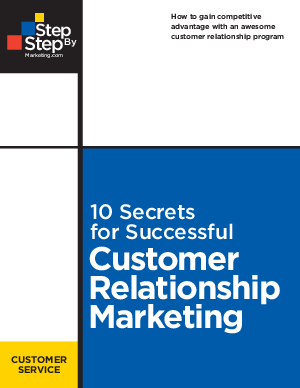 In 10 Secrets for Successful Customer Relationship Marketing you'll discover how can you build an emotional bond with your customers in a real, personal, and meaningful way. Plus: Specific strategies and tactics to help you gain and maintain a competitive advantage. How to start and sustain a dialogue with your customers and best prospects. How to keep your customers from straying. How to make your business stand out from the competition. How to determine the strength of your customer retention strategy. How to increase your brand identity, both online and in print. How to cultivate an environment of trust. How to skillfully question your customers. How to create an exceptional loyalty program. How to consistently exceed your customers' expectations. How to play to your customers' emotions. How to create a brand that really rocks. How to get everyone on your team to focus on customer service. How to show respect for your customers' privacy.